The time has come finally, where I can reveal my latest commissioned piece of work in collaboration with Deezer, the music streaming website. You may have seen the image being shared around social media, as it was in The Metro newspaper today!, but here is the finished, hi-res, image. 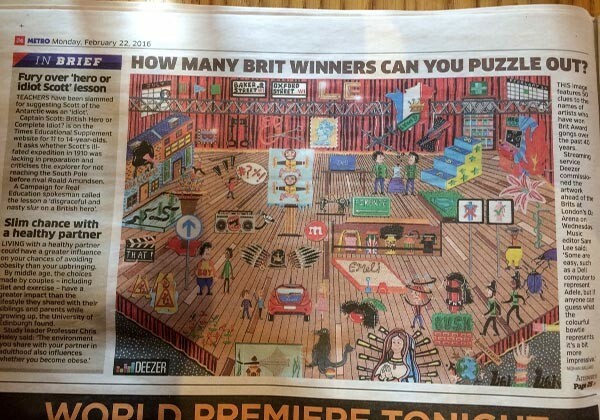 The brief from Deezer was to create a stage, and include fifty past winners of the Brit Awards in a visual pun format. It was definitely a challenge, not only fitting everything in, but just coming up with the visual ideas proved tough! I have to say, this has been one of the biggest jobs I’ve completed to date, but also one of the most fun. The illustration will be talked about on Spire FM Radio in the south from 12-1pm on Tuesday 24th February, and yesterday the Capital Breakfast show in the south was talking about it as well, so along with the Metro newspaper shot, the reception has been brilliant! So, sit back, relax, and take a little break from your day and see if you can guess all of the artists! I’d love to hear how many you all get as well.